Heavy-duty Cylinder Arm sewing machine with Reverse. Featuring a 10 1/2" x 7 1/2" working area. 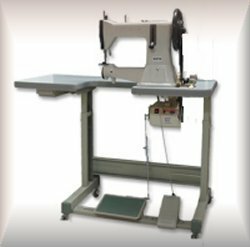 This Cylinder Machine is perfect for sewing saddles, sofas, luggage, inflatable's and other very heavy sewing applications. Includes; 3 Bobbins, 10-Needles, Oil, instruction manual. Cylinder Bed Length - 10.5"